Created by Liz Lemon to commend the tireless efforts of sporting athletes who must persevere in order to succeed. Incorporating a stainless steel tubular structure and aluminium castings each with water jet cut details of surrounding natural features. 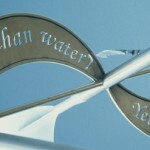 The twisting banner along the whole length of the main sculpture is again water jet cut with the following quote, originally by the Roman Poet Ovid.